Please read the story of our current family in need of adequate housing. 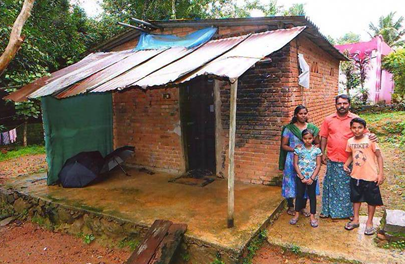 India's poor families do not have the financial means to buy or construct houses with their savings, and therefore they live in huts with mud walls and thatched roofs, or whatever other materials they can find. Antony [Sunil] is the head of the family. He belongs to Holy Family Church in Vijayapuram Diocese. He is a cooly laborer. His family consists of his wife and 2 children. His wife is a house wife. John Antony-elder son is studying in 7th standard. Second child is a girl Alphonsa who is a 3rd standard. Their cooperation in the parish activities is very positive. He has 8 cents of land. They have no good house. They couldn’t build a house without anybody’s help. They are asking our help to build a good house. He has great trust in God and has great hopes that generous people would come forward and help him in his predicament.